Transporting any type of firearm, real steel or airsoft, properly is a safety concern not just for you and your rifle, but also others. Until your boots are on an airsoft field or arena, keep your gun out of plain sight. 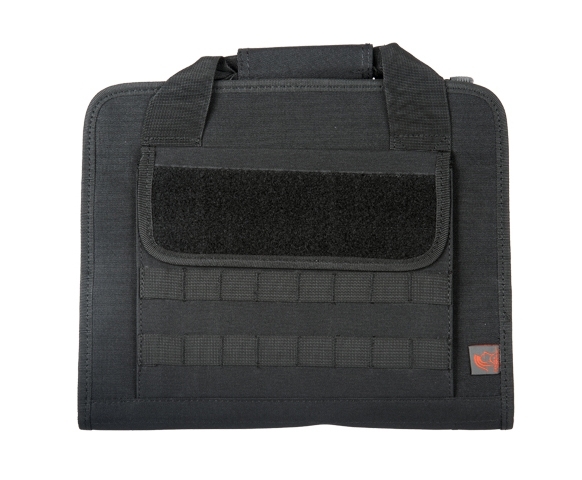 Transport your pistols in Lancer Tactical's MOLLE Soft Padded Pistols Carrying Case. Designed to hold not just one pistol, but two, as well as any other accessories you might want to bring, the Lancer Tactical Soft Padded Pistols Carrying Case is more than meets the eye. 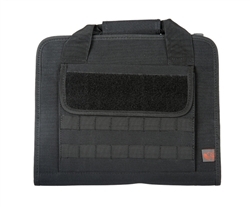 Constructed out of tough 600 Denier Polyester with a cushioned felt lining on the inside and a protective rigid frame on the outside this case will be able to carry your pistols with ease and efficiency. The interior is lined as well with various storage compartments including a line of pouches fit to hold 5 spare magazines on one flap and a sleeve pocket on the other. The front flap itself features another compartment for holding other tactical accessories as well as MOLLE webbing panels lining the front of it so you may attach additional MOLLE accessories to expand your carrying options. Finished with a Velcro panel for your favorite morale or name tag patches, the Velcro flapped pouch is available to carry other crucial items like a speed loader.